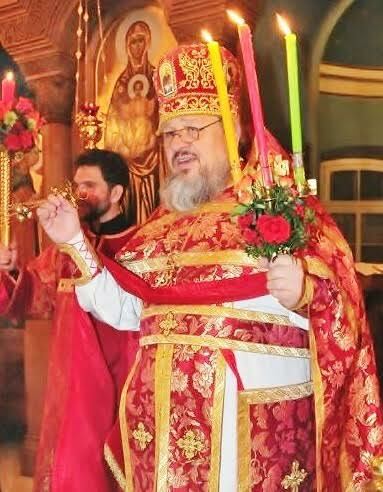 His Beatitude, Metropolitan Tikhon and His Eminence, Archbishop Irénée will concelebrate the Funeral Service for a Priest at Christ the Savior Cathedral, 823 Manning Avenue, Toronto, ON at 7:00 p.m. on Wednesday, October 12. The Divine Liturgy, followed by a Panikhida and memorial meal, will be celebrated at the cathedral at 10:00 a.m. on Thursday, October 13. For additional information please contact Archpriest Vasyl Kolega at 416-522-5237. Following the services in Toronto, Archimandrite Alexander’s body will be taken to Saskatoon, SK, his home town. He will lie in state at Holy Resurrection Sobor, 2202 Lorne Avenue. A Funeral Service will be celebrated at 7:00 p.m. on Monday, October 17. The Divine Liturgy, followed by interment at Woodlawn Cemetery, Saskatoon, will be celebrated at 10:00 a.m. on Tuesday, October 18. In order to accommodate the anticipated large number of clergy and faithful—Holy Resurrection Sobor is quite small—services will be held at Holy Family Roman Catholic Cathedral, 123 Nelson Road, Saskatoon. For additional information please contact Priest Leonard Herrem at 306-652-2847. On Sunday, October 9, a Panikhida was celebrated at the OCA Representation Church of Saint Catherine, Moscow, at which time the following message of condolence from Metropolitan Tikhon was read. A tribute to Archimandrite Alexander by Archpriest Lawrence Farley of Saint Herman of Alaska Church, Langley, BC, also appears on-line.